A few weeks ago I did something crazy. I ran in the 90 degree Houston heat for several miles. I went nice and slow but long. By the time I got home I was drenched in sweat. There was something rather sweet to this sweat, though. It felt great. Sweating means you’re working hard. As an entrepreneur, I sweat and make sacrifices daily. Startup life is nothing like the corporate chair. It’s the most uncomfortable, disruptive, and unsettling place. It’s that thing that pushes me to think differently about, well, everything. Just when I think I can sit in the chair nice and comfy, I get catapulted into something else. Oh and the sacrifices you have to make. There is no such thing as 9-5. I’ve been working globally for over 10 years now but this is some crazy sweat! Lately I’ve been swimming and sweating in a sea of complexity. So I managed to launch a proof of concept in 8 weeks that got crazy awesome response but now I need to scale my backoffice operations appropriately so I can grow. I’m a project manager – I know how to get things done. Operations was never my passion so growth pains like this make me sweat. They push me to think about how to get simpler in a more efficient, fast and cost effective way without compromising quality. Too often organizations grow too fast and don’t take time to do the needful. And quality usually goes first. For me quality is the heart of the experience. I’d rather quality than quantity any day, but most business heads think quantity = money = success. We live in a time and attention economy. If you can’t capture a market by making it easy for the customer (and easy to scale numbers), you’re going to fail. If your brand does nothing different or unique, you’re going to fail. If you can’t build processes and systems that “hum”, you’re going to fail. Simplicity wins and complexity dies, period. Time. When I look at what I was doing just a year ago, I was in a comfortable leadership role earning a great salary, benefits, etc. I could be in that chair but I chose this one. I chose sweat. 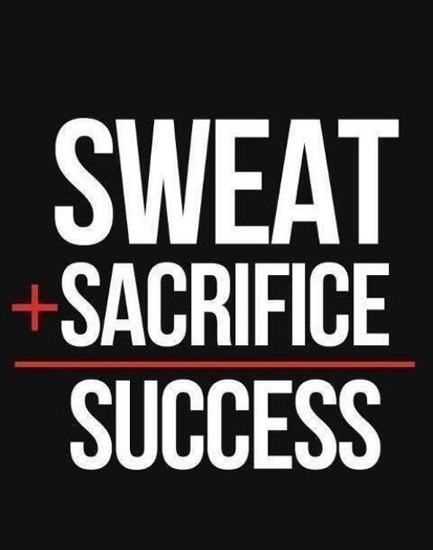 What are you sweating and sacrificing?